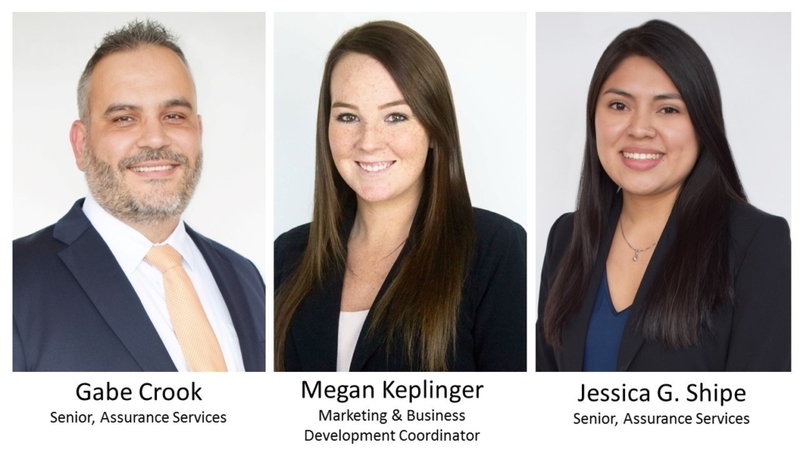 THF congratulates Gabe Crook and Jessica Gonzalez Shipe on their promotions to Senior in the Assurance Services Department along with Megan Keplinger to Marketing and Business Development Coordinator. Gabe graduated with a bachelor’s degree in business administration from Florida State University. Gabe joined THF in 2015, and has been providing accounting and management services for over 15 years. Industries served include insurance, governmental, and not-for-profit organizations. He has provided a range of services which include financial statement audits, compliance audits, agreed-upon procedures, limited and full scope audits of employee benefit plans, and financial statement reviews and compilations. He is a member of the FICPA and is currently sitting for his CPA exam. Jessica earned bachelor’s degrees in accounting and in finance from Florida State University. Since joining THF in 2015, Jessica has provided a range of services which include financial statement audits, compliance audits, federal and state single audits, and agreed-upon procedures. She has provided services to insurance, governmental, not-for profit entities, and employee benefit plans. She is a member of the FICPA and is currently sitting for the CPA exam. Megan attended Florida State University and received her bachelor’s degree and master’s degree in marketing. Megan has been providing marketing and business development services for THF since she joined in 2016. Megan’s responsibilities include proposal writing, planning and executing events, creating industry related blogs, generating leads, and helping grow the firm’s not-for-profit presence in the Tampa market. Megan is a member of the Marketing Maniacs, Tallahassee Network of Young Professionals, and the Emerging Leaders of Tampa Bay. THF congratulates Gabe, Jessica, and Megan on their promotions. Why Should You Have a Succession Plan? The Wayfair Decision: What Does it Mean?